“We weren’t allowed to cry or laugh”. An account from one of the last Magdalene Laundries in Dublin that closed in 1996. I remember 1996. Mary Robinson was the first female President of Ireland. ‘Ballykissangel’ was on the telly, and the film ‘Michael Collins’ was premiered. I saw the set of the burned out Four Courts when I was a kid. Mick McCarthy was manager of the Irish football team and the Spice Girls released their girl-power smash hit Wannabe. 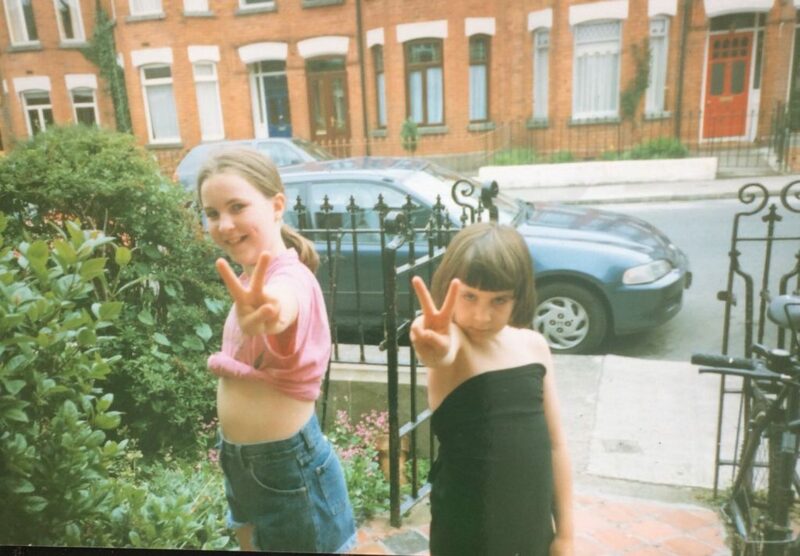 Katie O’Kelly and Clara Purcell from 1996 doing their Spice Girls act. On our street in Dublin, we spent the summer making up dance routines to it in our cycling shorts and Boyzone Tshirts. It’s hard to believe that while we were arguing about who got to be Sporty Spice there were women incarcerated in Laundries all over the country, never told when they would get out and forced to work in excruciating conditions for no money. Free slave labour. I found out recently that one of the last Laundries to close was in Donnybrook, five minutes from where I grew up. Last week we Repealed the 8th Amendment, a huge win for women’s rights that have been oppressed and silenced for too long. But we still have a long way to go in unearthing and comprehending the systematic abuse inflicted on so many women for so long in this country. Justice must be sought. The church still hasn’t paid out the vast majority of what it owes to Magdalene Survivors. They seem to essentially be sitting on their hands until it is too late and there are no survivors left. On Tuesday evening, I was outside the Mansion House as eight bus loads of Magdalene Survivors were driven to the Mansion House for a reception with the Lord Mayor and the President of Ireland. I bawled my eyes out at the sight of all these amazing women, ranging from their 40s to 90s, who had suffered so much at the hands of the Irish State and the Catholic Church. One woman shouted to me that the women of Ireland have ended this with the referendum, the stranglehold that our country has been in since the foundation of the Republic. But we still have a long way to go to fight for justice for Magdalene Survivors. We cannot afford to be complacent ever again. And we cannot forget our collective past. This piece was written by Belltable Artist in Residence 2018 Katie O’Kelly. Read the Irish Times article which inspired this post here. To book tickets for the work in progress reading of Displace at Belltable on Wednesday, June 20th, at 8pm phone box office on 061 953400, ext 1 or visit our website.